It’s that time of the year again – we will know who wins the Nobel Prize of Literature on 13 October. Hopefully we will discover someone like Patrick Modiano and Svetlana Alexievich, who were virtual unknowns in the Anglophone West-centric literary world of ours. 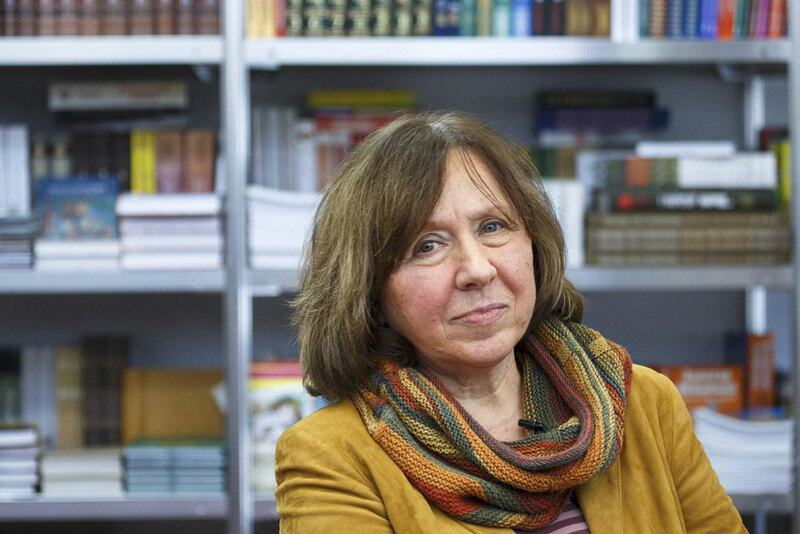 The works of Modiano and Alexievich only started to arrive in India after their Nobel wins; we would have been denied of their profound works which experimented with form and the way of saying, if the Nobel Prize wasn’t conferred upon them. Their works weren’t also published by the mainstream UK and USA publishers, and this says a lot about the motivation and the ability of the Anglophone world to recognize and publish world literature. One feels a certain gratitude for the Nobel Prize for being the only prize in our world that continues to identify and celebrate literature. India hasn’t won the Nobel Prize for Literature since Tagore–it has been over 100 years since that momentous event for Asia. The reasons for that could be many: regional language literature wasn’t translated or didn’t find its way to Europe. In Calcutta, there are still passionate discussions about why certain Indian authors – who didn’t write in English – should have won the Nobel Prize, but they didn’t, because they were not promoted by the Indian literary ecosystem. The names of Jibananda Das, Bibhutibhushan Bandopadhyay U.R. Ananthamurthy and Ashapurna Devi are always mentioned. This ecosystem has now progressively become very dependent upon the Anglosphere (London and New York) to determine for them, what should be promoted and valued. The Indian mainstream press and media, whose global political narratives are also largely dependent upon the mainstream Western media supports this worldview. We are largely still piggybacking on the Anglophone west, which Gayatri Spivak calls ‘Intellectual Colonisation’. Even the Indian Lit Prizes – which have become very predictable – are largely dependent upon the perception of the gatekeepers of the publishing world of the West, and more often than not take their cue from western recognition. Instead of works from the East going to the West, the major flow is from the West to the East, on which the boat of Indian Anglophone Literary World is sailing. This sailing with the current, and not against it, can and does have a detrimental effect upon Indian writing in English, in terms of what is essential aimed for through the writings – authors might follow the cue of a narrow band of novels, in order to get published in the Anglophone world and to seek Western validation. This might curb originality, experimentation and the free flow of creative imagination. We find that certain types of literary novels by Indian authors are more accepted for publication than the Indian novels which have moved away from the themes of immigration, post-colonialism, elucidation of Indian history and culture etc. to newer themes such as memory, 21st century modernity and philosophical inquiries. This gives the impression that the publishing world of the Anglophone West is not really looking for new promising Indian literature, but looking for certain types of novels – which are often stereotypical in their outlook and execution – which fit their pre-existing notions of India closely aligned with the market that consumes novels which are published under the multicultural agenda. This neoliberal ideology-inspired policy of trying to make literature economically profitable has resulted in the explosion of literary fiction of various levels whose values and principles have made literary fiction accessible to a larger readership. The trend started in mid-eighties and rose through the nineties, and is continuing in the second decade of the 21st century. But this risk-averse commercially successful policy has also had a detrimental effect in terms of literature, and has diluted some of its core values. The focal point of all the criticisms against the modern English novel lead to what Kundera anticipated in the eighties – repetition of form, lack of discoveries and the absence of the hitherto unsaid, which can lead to the end of the history of the novel: authors ceasing to seek out the never said, not inventing new forms, avoiding deep complexities and succumbing to serve the taste of the masses. Going by the points raised by the critics of the modern English novel, we can understand that Literature and its values have diminished in the Anglophone West in the 21st century, because of the excessive importance given to the perceived notion of the market and to expand readership. If one has to find literature, one has to look beyond that Anglophone sphere. We thus need more translations of world literature, and less of the predictable English language literary fiction that is coming to us from the West. Literary Fiction is not Literature; we need to distinguish between the two. The ‘frequency of consciousness’ – a term I borrow from Indian philosopher Abhinava Gupta of Kashmir Shaivaism – of literary fiction and of literature are very different. There are other crucial differences between depth, language, voice, tone, universality, layers, meaning, impulse, vision, form and so on. At present, we do have a large problem in our way of seeing and judging. Our over-dependence upon the perceptions and narratives of the market-oriented Anglophone West (London and New York) is also taking us away from innovations, independent thinking and the courage to go against the flow. What we teach in the outdated courses in our Universities – which are suffering from a colonial hangover – is also failing to expand the idea of literature in the 21st century world. We seem to be more contend to remain in the relatively shallower world of literary fiction, than to delve into the deep world of literature. Is the PR driven game-show format of The Booker and The Pulitzer is having a detrimental effect on Indian writing in English? Are Indian writers aspiring for the styles/values/themes which dominate the commercial literary fiction world of Anglophone West and not aspiring to go beyond them? Do juries, critics and readers in India have the ability to distinguish literature from literary fiction? These are the questions, which we need to ponder about, if we aspire to create and to read literature in the 21st century India. We need to understand that only literature can speak to us in a special ‘frequency of consciousness’ which can combine various impulses, tell stories, offer aesthetics, interpret existence, expand knowledge, take leaps in imagination, create new forms, make us see the invisible, address fundamental questions, make us think deeply about ourselves and our world, and shape our consciousness, in a profound manner. In India, due to our historic English language associated links with UK, the gatekeepers, the critics, the academics, the prize juries, the publishing houses and the media and thus the conversations and discussions about literature/literary fiction are dominated by various coteries who speak more about the books and the authors who write in English. But we need to go beyond that, and also listen to the greater world. Dag Solstad, Adam Zagajewski, Adonis, Cesar Aira, Amos Oz, Javier Marias, Peter Handke, Jon Fosse, Ko Un, Antonis Lobo Antunes and Ngugi Wa Thiong’o are some of the examples of authors, poets and playwrights whom we need to read; and this illustrious bunch might also dominate the winners list of the Nobel Prize for Literature within the next decade. As far as 2016 Nobel Prize for Literature is concerned, I would be happy to discover yet another unknown (who hasn’t been mentioned above), who will help us to recover, to understand, to relish and to celebrate the sublime values, and the profound spirit, of literature.